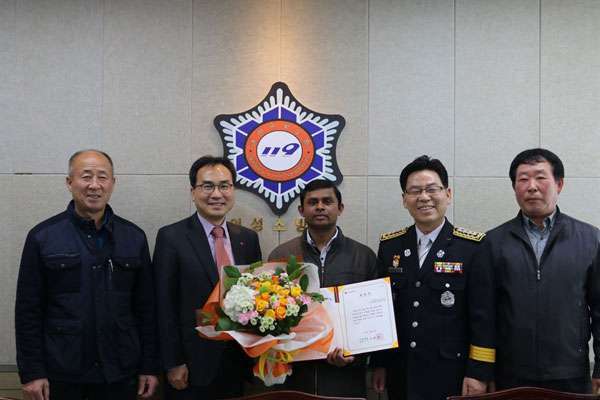 After saving a woman, 90, from a burning house in North Gyeongsang Province last year, a Sri Lankan migrant worker in South Korea has been awarded Permanent Residency (PR) status. The Daegu Immigration Office will officially grant the status to Katabilla Ketiye Ge-Dara Nimal Siri at the office on Dec. 18, according to the Ministry of Justice on Sunday. The decision was made on Dec. 13 when the ministry held a meeting for protection and improvement of human rights of foreigners. The committee decided unanimously to grant the status to the Sri Lankan, 38. Nimal arrived in Korea on a work visa in 2013. The document expired after three years in September 2016, but he decided to stay. He did not want to go back to Sri Lanka where he could earn the equivalent of about 500,000 won ($440) a month, compared to 1.8 million won in Korea. In February 2017, Nimal, working at an orchard in Goro-myeon district in Gunwi-gun County in the province, saved the woman from a nearby burning house. He suffered second degree burns to his neck, wrists and head and a lung injury from inhaling toxic gas while saving the woman. He has been receiving medical treatment for the lung injury. Nimal received attention not only from people in the neighborhood but also from business industry and the Korean central government. In March that year, Uiseong Fire Station in the province awarded Nimal the “LG Honor,” an acknowledgement by major Korean major conglomerate LG Group of his courage and sacrifice, plus a 30 million won reward. He became the first foreigner to receive the award since it was introduced in 2015. The following June, he was selected by a 15-member committee comprised of officials from the health and welfare, veterans' affairs and justice ministries, as well as lawyers and doctors, to be honored for reflecting the Protection of Persons Killed or Wounded for a Righteous Cause Act. The committee picked him even though his legal stay status had expired.